TOTAL FLANKER...a rugby blog: Woodward set for new role? Woodward set for new role? 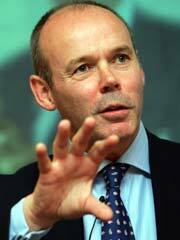 It has emerged overnight that Prime Minister Gordon Brown has asked former England rugby supremo Sir Clive Woodward to spearhead the Labour Party's forthcoming campaign for the General Election. Sources inside the Labour Party indicate that the Party's hierarchy have concluded that Brown is more or less unelectable without outside help, hence the return of Tony Blair to endorse Brown's credentials earlier this week and the recruitment of the man who delivered Rugby World Cup glory to England in 2003. It is understood that the power-brokers behind the deal are Blairites Peter Mandelson and Alistair Campbell, Blair's former spin doctor who formed a close bond with Woodward during the 2005 British & Irish Lions tour to New Zealand. Various rumours have been circulating in recent days regarding a planned return by Woodward to Twickenham as a probable replacement for RFU Director of Elite Rugby Rob Andrew. It appears, however, that such rumours were an elaborate smokescreen and that Woodward's ambitions are far loftier. If Labour succeed in being elected for a record consecutive fourth term it is not known whether Woodward - currently the Director of Elite Performance at the British Olympic Association - will be offered a Cabinet role. Much will depend on whether he decides to accept a proposed peerage to sit in the House of Lords or whether, as is rumoured, he would prefer a seat in the House of Commons. To this end it is believed that Labour are investigating the possibility of parachuting Sir Clive into a safe seat for the Election. "My kid's better than your kid"
The Best Rugby Player You Never Saw?